Jim Hall's race cars and the Corvair had a little bit in common. Using Richard Falconer's book Chaparral: Complete History of Jim Hall's Chaparral Race Cars 1961-1970 as a reference, we'll show you a few things you probably didn't know. You may remember way back in the mid to late 60s the race cars that a Texas engineer by the name of Jim Hall was campaigning in several race circuits more notably in the Can-Am series. They were without a doubt the most innovative racing machines of their time. I had kind of a personal interest in Jim's efforts. I was a young engineering student at Arizona State University trying to figure out what I wanted to do when I grew up. Jim Hall was the only one at the time that was using wind tunnel data for designing the shape of his racecars. We had a wind tunnel at ASU and I thought it would interesting to investigate the possibility of being an aerodynamic engineer. He, being one of the only engineers to be using aerodynamics at the time for racing, seemed like a good man to ask a few questions about the possibilities in that career field, so I wrote him a letter and asked his opinion never thinking that I'd ever hear from him. Several weeks later I received a very nice letter from him apologizing for not writing sooner - he was busy racing cars in Europe - along with some drawings of his 2E that were suitable for making a model that could be placed in a wind tunnel. He also suggested that I forget aerodynamics as a career. One engineer could to do all the work for the entire auto industry and still have time to hold down a full-time job. It might be a little tough finding a job, was his thought. I took his advice and pursued a career as a mechanical engineer. When Falconer's book on the Chaparrals came out I bought one immediately. As I thumbed through the pages I started seeing all sorts of little Corvair "clues". In June 1962 General Motors displayed the mid-engined Chevrolet Corvair Monza GT at Road America. It was during the race that Jim Hall met Frank Winchell, who headed the GM R&D team responsible for the GT. This meeting led to a sharing of information and testing facilities, including wind tunnel data on the Monza GT. Some of the styling references for the Chaparral 2 Coupe came from the Monza. 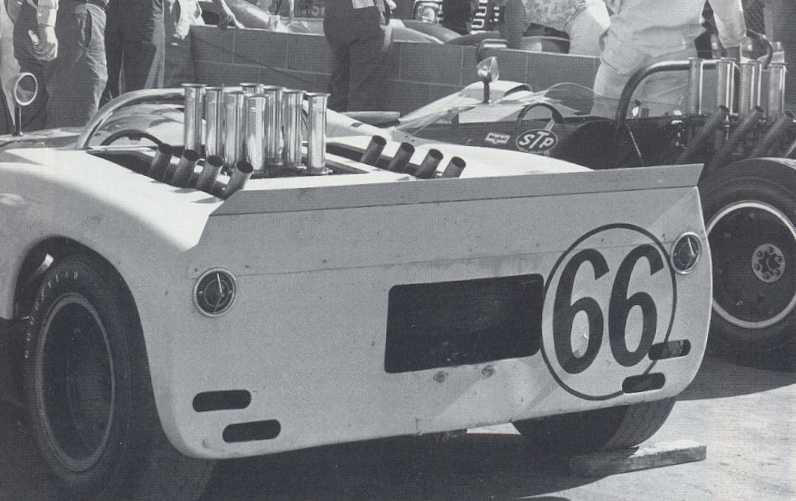 According to the mechanical specifications in the book, the Chaparral 2A chassis 001 was powered by an alloy small block 327 that popped out between 415 and 475 horsepower using 4 - 2 barrel Weber 48 DCOE carbs and a Corvair 4-speed transmission. In May of 1964 the Corvair transmission gave way to a single speed automatic gearbox. Tire design was another area the Corvair helped Jim Hall's efforts. Jim: "At one point in time Chevrolet had more information and more knowledge on tires than Firestone themselves. They built the first really sophisticated tire grinders to simulate worn tires for the Corvair litigation cases. They took that entire area two or more toes up the ladder of technology. They could actually simulate the worst possible conditions for a tire that had worn incorrectly like it might on swing-axle suspensions. The tire guys were dumbfounded; I remember that when they [Firestone] were asking them to build tires for the Chaparral, the tires guys were being told by Chevrolet how to build tires." Jim Hall, Hap Sharp and Roger Penske did some work on the Corvair at Hall's Rattlesnake Raceway in Midland, Texas - a track which Hall constructed to do test work on race cars which GM utilized as well. Jim: "I did quite a bit of work on the Corvair. I used to drive it around with the tires deflated so the rims touched the ground. We had to show how far out you could get it and keep the car the right way up. When they designed and built that thing they looked at what was on the market and there were several small cars like the Volkswagen Beetle: it was out there and it would hurt anybody. They were wrong, and of course they immediately took steps to improve it, but that was eventually the demise of the car and that was a shame. "What we found out is that you can turn over any passenger car on dry concrete - and it doesn't matter whether it's a Corvair or a Ford Fairlane. All you needed to do was to be brutal with the steering. There's no question of that; it's not a question of either/or, you can do it to all of them. A swing-axle car will jack, and its center of gravity gets higher and its track gets narrower so it's easier to turn over. End of story." The remains of Chaparral's tire testing rig lie derelict in 1985 near the Rattlesnake Raceway skid pad. The engine that drove the sole wheel was a flat-six Corvair powerplant. More recently, Hall intimated that he might restore the unit. The Corvair also supplied taillights for many of the Chaparrals. Not that that's a big deal but, let's face it, there's a little "Corvair" in all of us! 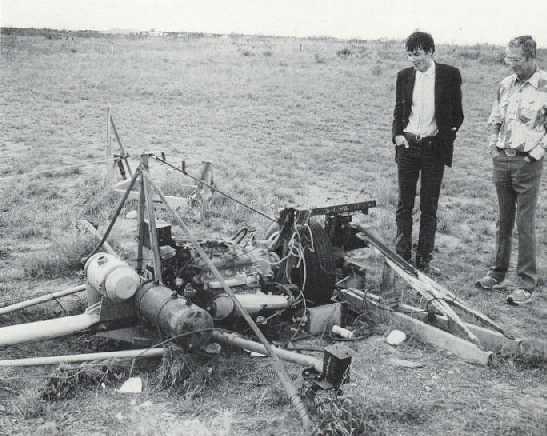 Jim Hall, far right, with Richard Falconer having a look at the tire testing rig. If you look closely you can see that someone has stolen the carburetors - no doubt to use on one of the Chaparral race cars! 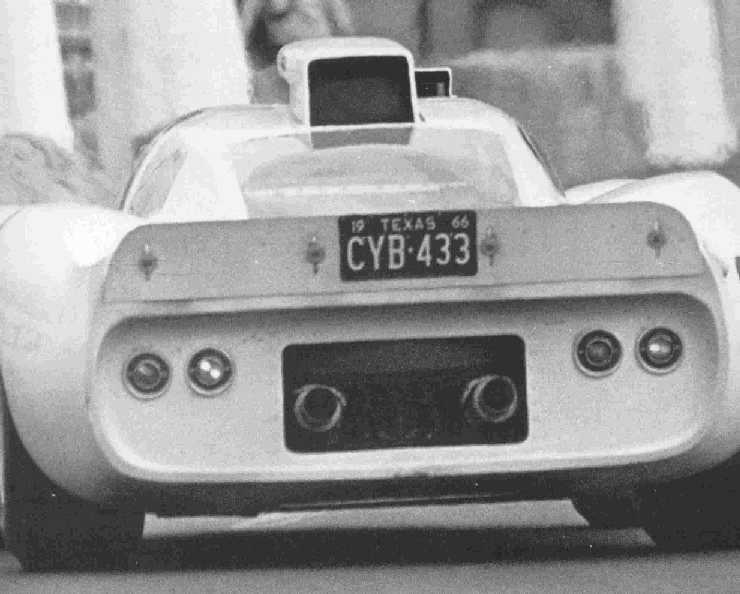 Here is a Chaparral 2G at the 24 Hours of Le Mans in June 1966 with a beautiful set of '64 Corvair tail and back-up lights. 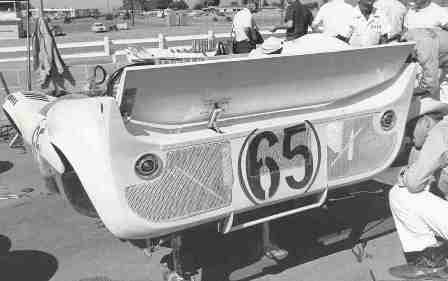 Another 2A at the Los Angeles Times Grand Prix in October 1966 with a set of '64 tail lights. 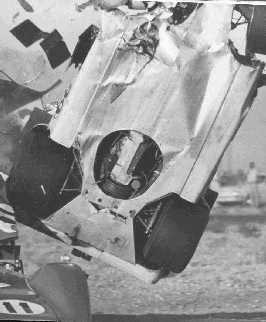 This shot was taken of a Chaparral 2G at the Starburst Grand Prix in Las Vegas in November 1968 as it became airborne after striking the rear of a McLaren. WARNING: This car had NO Corvair tail lights!